Feel at home in our centrally air conditioned elegant rooms and start your day with our lavishly spread Complimentary buffet breakfast. 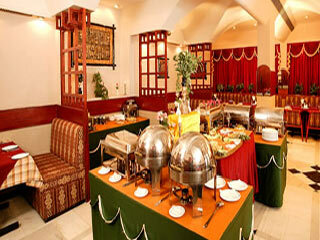 Indulge in your fantasies as you explore the delicious variety of spread of 'Paruvaa'-our multi-cuisine restaurant. Security Guard, Bar, Backup Generator, Doctor on Call, Travel Counter, Room Service, Airport Transportation, Restaurant, Laundry Facilities, Parking. Safe Deposit Locker Facility, H/C Water, House Keeping, DVD Player, Attached Bathroom, Air Conditioning Room, Complimentary Newspaper, Toothbrush/Razor on Request, Wakeup Calls, Cable/Satellite TV. Restaurant, Parking, Laundry Facilities, Doctor on Call, Business Facilities, Breakfast Services, Room Service, Bar. User reviews for "Heritage Inn Hotel Coimbatore"